This timeless Structures(TM) mirror features a Brushed Nickel finish to create a unique statement for your home. Q Do the dimensions of this mirror (41056NI) include the frame? A The dimensions of the Kichler Lighting Structures Mirror in Brushed Nickel do include the frame. Q What is the dimensions of this mirror including the frame? 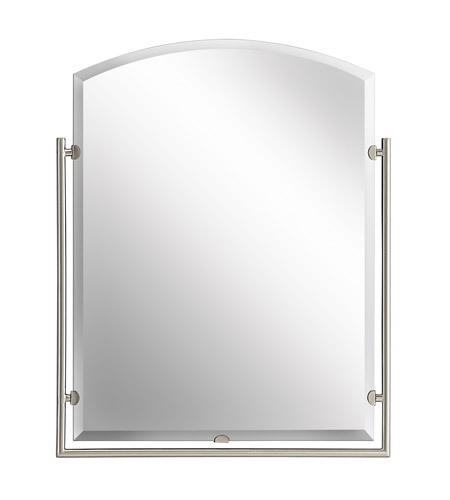 A The Kichler Lighting Structures Mirror 41056NI is 30"H by 24"W.
Q Would this mirror be suited for use in a bathroom? A Yes, the Kichler Lighting Structures Mirror 41056NI is listed in the Kichler catalog as a bathroom mirror. Q What are the dimensions of the mirror without the frame? A The Kichler Lighting Structures Mirror 41056NI dimensions of the mirror without the frame is: width 21.75", height 28.75"
Q Does this mirror come assembled? A Yes, the Kichler Structures Mirror 41056NI does come as one piece. Q Can we get this mirror in polished chrome? A The Kichler Structures Wall Mirror 41056NI collection does not, but this item is similar to that item in chrome. Please see 41011CH.